Charles Thomas Osborne (24 November 1927 – 23 September 2017) was an Australian journalist, theatre and opera critic, poet and novelist. He was the assistant editor of The London Magazine from 1958 until 1966, literature director of the Arts Council of Great Britain from 1971 until 1986, and chief theatre critic of Daily Telegraph (London) from 1986 to 1991. The London Magazine is a publication of arts, literature and miscellaneous interests. Its history ranges across nearly three centuries and several reincarnations, publishing writers including William Wordsworth, William S. Burroughs and John Keats. The Arts Council of Great Britain was a non-departmental public body dedicated to the promotion of the fine arts in Great Britain. It was divided in 1994 to form the Arts Council of England, the Scottish Arts Council, and the Arts Council of Wales. At the same time the National Lottery was established and these three arts councils, plus the Arts Council of Northern Ireland, became distribution bodies. Osborne's father hailed originally from Devon and his mother was from Vienna, a fact to which he attributes his lifelong love of opera. He went to school locally, then studied at the University of Queensland. Osborne then worked in literary and musical journalism and in repertory theatre in Australia and Britain, where he settled permanently in 1953. He played the role of Front Gunner Foxlee in the film The Dam Busters (1955), and acted in many plays across the UK  including Black Coffee by Agatha Christie, which he later adapted as a novel. The Dam Busters is a 1955 British epic war film starring Michael Redgrave and Richard Todd. It was directed by Michael Anderson. The film recreates the true story of Operation Chastise when in 1943 the RAF's 617 Squadron attacked the Möhne, Eder, and Sorpe dams in Nazi Germany with Barnes Wallis's bouncing bomb. Black Coffee is a play by the British crime-fiction author Agatha Christie (1890–1976) which was produced initially in 1930. The first piece that Christie wrote for the stage, it launched a successful second career for her as a playwright. Between 1971 and 1986 he was literature director of the Arts Council of Great Britain. This involved dispensing government grants, and Osborne, perhaps inevitably, given the nature of the position, became embroiled in the so-called "poetry wars" that took place during the 1970s. Osborne gave an account of his tenure at the Arts Council in his autobiography Giving it Away: Memoirs of a Uncivil Servant. This sheds light on his influential role at the Arts Council,  as does Peter Barry's 2006 book, Poetry Wars: British Poetry of the 1970s and the Battle of Earl's Court. Osborne published an original novel, Pink Danube, in 2000 and adapted works for the stage as novels, which have been widely reprinted and translated into many languages. His novelised versions of Black Coffee (1998), The Unexpected Guest (1999) and Spider's Web (2000), all originally by Agatha Christie, have proved enduringly popular with readers. He has also adapted Blithe Spirit (2004), by Noël Coward, and Oscar Wilde's The Importance of Being Earnest . Osborne held an honorary doctorate from Griffith University, Brisbane, Australia, for services to the arts and was a fellow of the Royal Society of Literature. He was a former president, and later council member, of the UK Critics Circle. 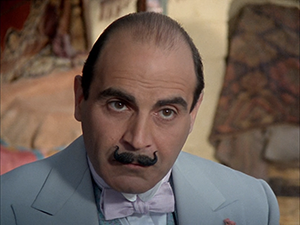 Hercule Poirot is a fictional Belgian detective, created by Agatha Christie. Poirot is one of Christie's most famous and long-running characters, appearing in 33 novels, one play, and more than 50 short stories published between 1920 and 1975. 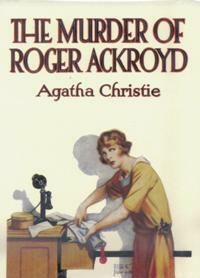 The Murder of Roger Ackroyd is a work of detective fiction by British writer Agatha Christie, first published in June 1926 in the United Kingdom by William Collins, Sons and in the United States by Dodd, Mead and Company on 19 June 1926. 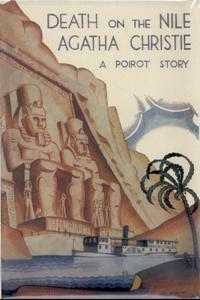 It is the third novel to feature Hercule Poirot as the lead detective. The Secret of Chimneys is a work of detective fiction by Agatha Christie, first published in the UK by The Bodley Head in June 1925 and in the US by Dodd, Mead and Company later in the same year. It introduces the characters of Superintendent Battle and Lady Eileen "Bundle" Brent. The UK edition retailed at seven shillings and sixpence (7/6) and the US edition at $2.00. The Man in the Brown Suit is a work of detective fiction by Agatha Christie, first published in the UK by The Bodley Head on 22 August 1924 and in the US by Dodd, Mead and Company later in the same year. The UK edition retailed at seven shillings and sixpence (7/6) and the US edition at $2.00. The character Colonel Race is introduced in this novel. Il trittico is the title of a collection of three one-act operas, Il tabarro, Suor Angelica, and Gianni Schicchi, by Giacomo Puccini. The work received its world premiere at the Metropolitan Opera on 14 December 1918. 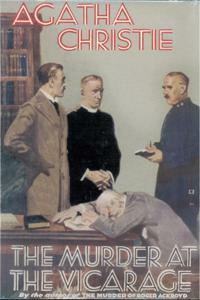 The Murder at the Vicarage is a work of detective fiction by British writer Agatha Christie, first published in the UK by the Collins Crime Club in October 1930 and in the US by Dodd, Mead and Company later in the same year. The UK edition retailed at seven shillings and sixpence (7/6) and the US edition at $2.00. 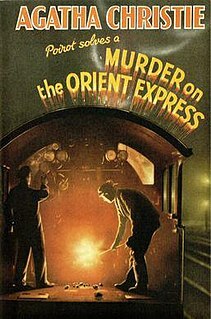 Sparkling Cyanide is a work of detective fiction by British writer Agatha Christie, first published in the US by Dodd, Mead and Company in February 1945 under the title of Remembered Death and in UK by the Collins Crime Club in the December of the same year under Christie's original title. The US edition retailed at $2.00 and the UK edition at eight shillings and sixpence (8/6). The Pale Horse is a work of detective fiction by Agatha Christie and first published in the UK by the Collins Crime Club on 6 November 1961 and in the US by Dodd, Mead and Company the following year. The UK edition retailed at fifteen shillings and the US edition at $3.75. The novel features her novelist detective Ariadne Oliver as a minor character, and reflects in tone the supernatural novels of Dennis Wheatley who was then at the height of his popularity. The Pale Horse is mentioned in Revelation 6:8, where it is ridden by Death. Superintendent Battle is a fictional character created by Agatha Christie who appeared in five of her novels. Sir Max Edgar Lucien Mallowan, CBE was a prominent British archaeologist, specialising in ancient Middle Eastern history. He was the second husband of Dame Agatha Christie. Jean-François Miniac, better known under his pen name Solidor, is a French comic book creator. He was born in Paris born, February 17, 1967, and lives in France. 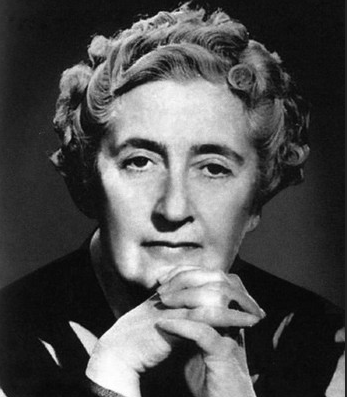 An Autobiography is the title of the recollections of crime writer Agatha Christie published posthumously by Collins in the UK and by Dodd, Mead & Company in the US in November 1977, almost two years after the writer's death in January 1976. The UK edition retailed at £7.95 and the US edition at $15.00. It is by some considerable margin the longest of her works, the UK first edition running to 544 pages. It was translated and published in Greek, Italian, Polish, Portuguese and Spanish. Symphony No. 7 in D major, K. 45, by Wolfgang Amadeus Mozart, was completed in Vienna in January 1768 after the family's return from a visit to Olomouc and Brno in Moravia. The symphony is in four movements. Its first performance was probably at a private concert. The symphony was reworked to become the overture to Mozart's opera, La finta semplice, K. 51, composed and performed later that year, and the overture itself was subsequently adapted further to create a new symphony, known in the Köchel 1964 (K6) catalogue as K. 46a. The autograph of the score is preserved in the Staatsbibliothek Preusischer Kulturbesitz in Berlin. 1 2 3 4 5 6 7 8 Campbell, Ian. Obituary - Charles Osborne. Opera, November 2017, Vol.68 No.11, p4133. 1 2 "Charles Osborne, actor, poet, critic and biographer – obituary". The Telegraph . 2017-10-13. ISSN 0307-1235 . Retrieved 2017-10-15. (Subscription required (help)).